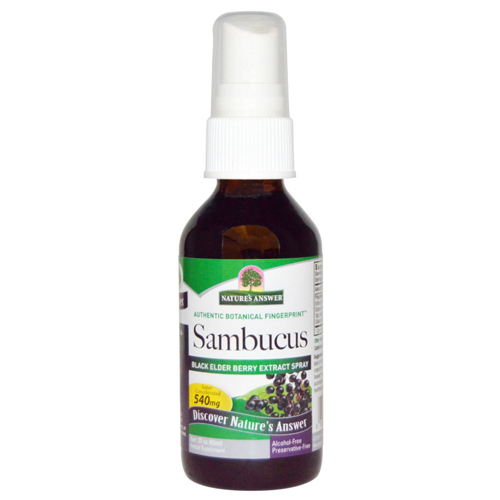 Nature`s Answer Sambucus Black Elder Berry Extract combines the immune supporting herbs sambucus (black elderberry), echinacea, propolis and astragalus with the soothing essence of Sage and slippery elm in an all natural, alcohol-free spray. Proprietary Herbal Blend Extracts of: Sambucus (Black Elderberry, Sambucus nigra), Slippery Elm Bark (Ulmus rubra), Echinacea (E. purpurea) Tops, Astragalus (A. membranaceus) Root, Sage Leaf, (Salva officinalis), Propolis. Shake well. Spray 1-2 times directly to the back of the throat and swallow. Below are reviews of Nature`s Answer Sambucus Elder Berry Spray - 60ml by bodykind customers. If you have tried this product we'd love to hear what you think so please leave a review.